Surprising as it seems, summer is already standing at the tip of my nose – I can feel it. Not only do I find that my fingers are increasingly jamming their paddy tips into my eye sockets to alleviate their itch, my palms are also becoming hotter and more sluggish. As it seems, I need to get smooth, something real smooth, and cool, too. And though it’s smooth and luscious like semi-liquified haagen dazs, I think there’s one little detail that pushed it over the top for me: the microscopic morsels of pulverized peanuts and chocolate that sort of mimic the grittiness of blended ice. So, do use chocolate-covered peanuts instead of using cocoa or chocolate syrup and peanut butter….it’s just not quite the same. The recipe is kind of obvious, isn’t it.. but here it is, in a more official(?) kind of way! As with all milkshakes, the goal is to make you feel like a three-year-old, so if a little extra agave does the trick, why not? 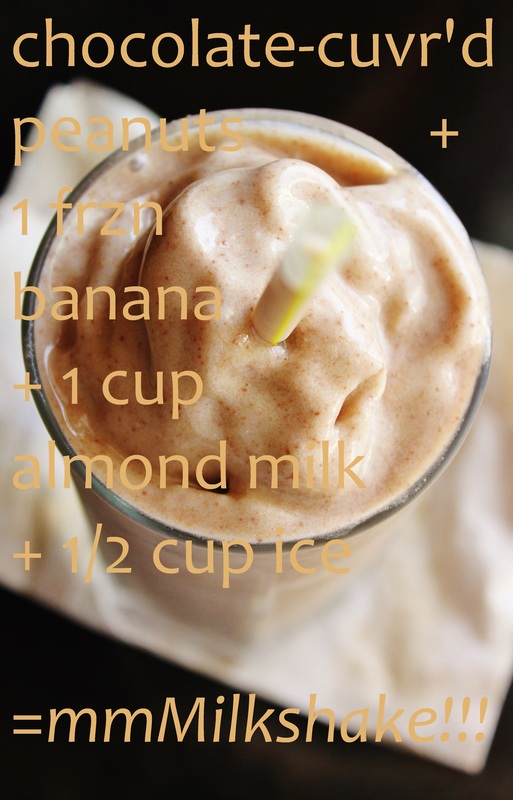 To make the milkshake, put all ingredients in the blender as listed. Cover with the lid, and start blending at a low speed, then bring it up to its fastest setting. Use the tamper to push ingredients into the blades to speed up the process. Once the contents are smoothly running and churning, continue blending for 10~15 seconds, or until smooth but still very thick and with tiny gritty bits of candy left.